In 1978 contemporary New Zealand artist Barry Thomas undertook a public art project in inner city Wellington. 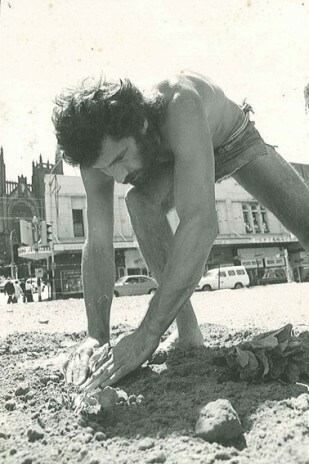 Utilising a vacant lot on the corner of Willis and Manners Streets, the artist and his friends cut through a wire perimeter fence, delivered a truckload of top soil to the site and planted 180 cabbages. Barry Thomas, ‘Vacant lot of cabbages’ documentation, 1978. Purchased 2012, Te Papa. Photo: courtesy of Barry Thomas. The project Vacant lot of cabbages (also known as ‘The cabbage patch’) immediately caught the public attention and received extensive media coverage. 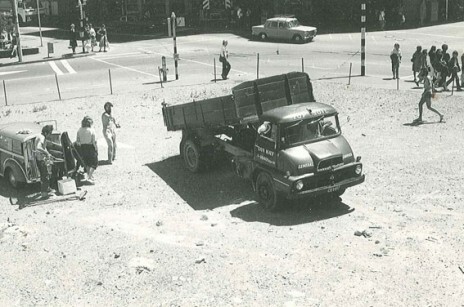 Barry was interviewed in local newspaper The Evening Post where he challenged Wellingtonians to occupy the vacant lot and claim the site as their own. The lot was quickly filled with all sorts of objects—which the city council promptly cleared away—except for the cabbages. For several months the vacant-lot-turned-urban-garden became the site of informal gatherings, events and a one-week arts festival called ‘The Last Roxy Show’. Vacant lot of cabbages featured in Jim and Mary Barr’s exhibition When art hits the headlines: a survey of controversial art in New Zealand at the National Art Gallery’s Shed 11 venue in 1987. The project is also discussed in Christina Barton’s history of temporary art in Wellington published in Wellington: a city for sculpture (Wellington: VUP and Wellington Sculpture Trust, 2007). Journalist Chris Trotter has described Vacant lot of cabbages as ‘a conceptual artistic statement against the life-negating conservatism of the Muldoon years [which] quite literally grew into a life-affirming (and edible) challenge to Wellington’s bureaucratic soul’ (Dominion Post, 20 August 2010, full article here). Te Papa has recently acquired Thomas’s archive of the Vacant lot of cabbages project for its collection as it documents an important moment in New Zealand’s art and social history. It is especially timely to consider the project in light of recent art initiatives (e.g. Letting Space in Wellington and Gap Filler in Christchurch)—not to mention wider social phenomena such as the Occupy movement, urban farming and guerrilla gardening. p.s. Wellingtonians take note – this Saturday 3-5pm at City Gallery there will be a discussion about recent temporary art including Letting Space, Gap Filler and the Performance Arcade. Really amazing to know about the efforts of fruit trees. Will add an important moment to the New Zealand’s social art history.